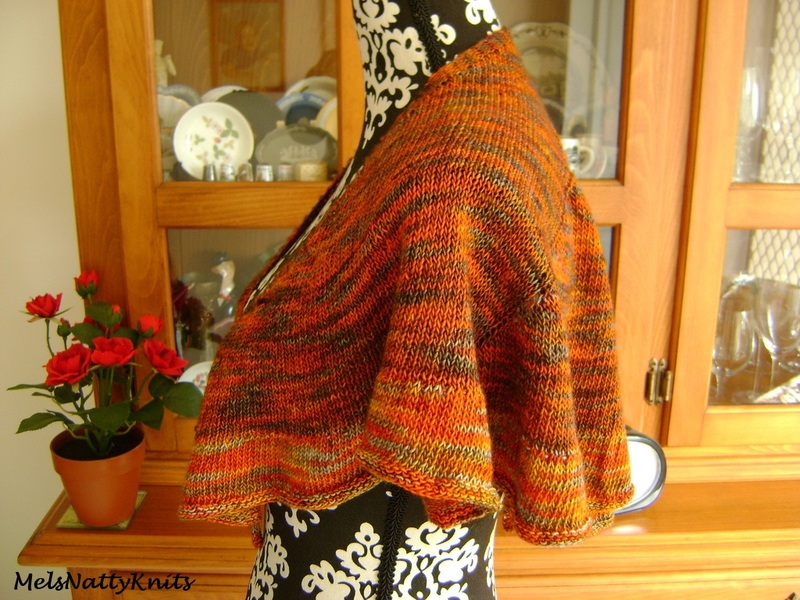 When I first saw this shawl I knew instantly that I wanted to make one. 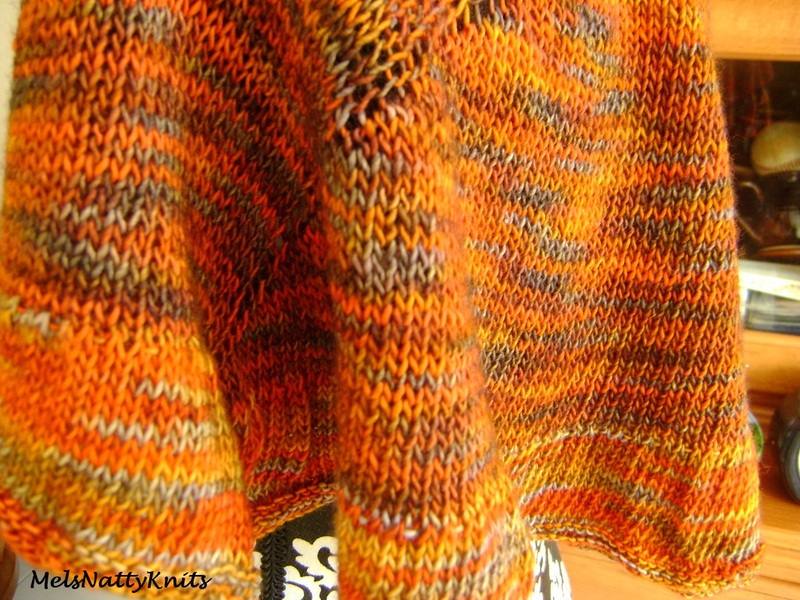 I think it was a combination of the mock cabling and the colour of the yarn! 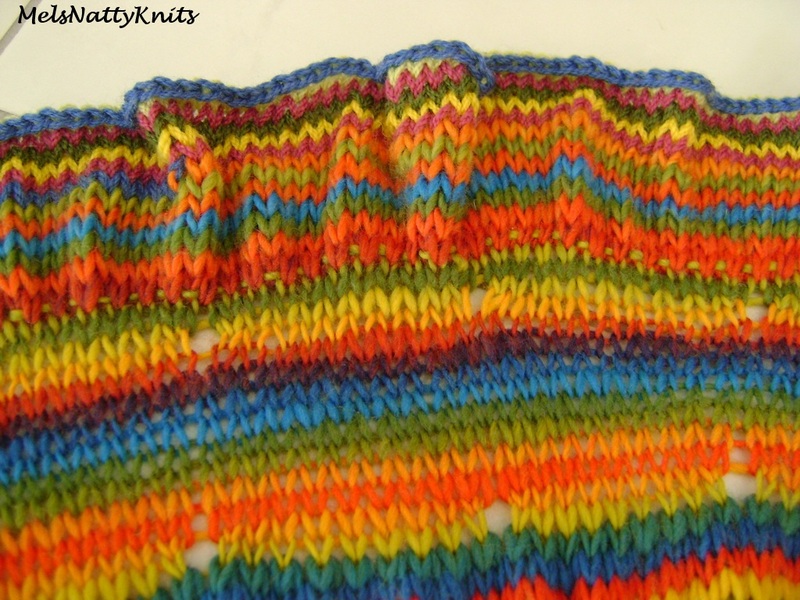 Unfortunately, at that stage the pattern hadn’t been written so I had to wait patiently for it. 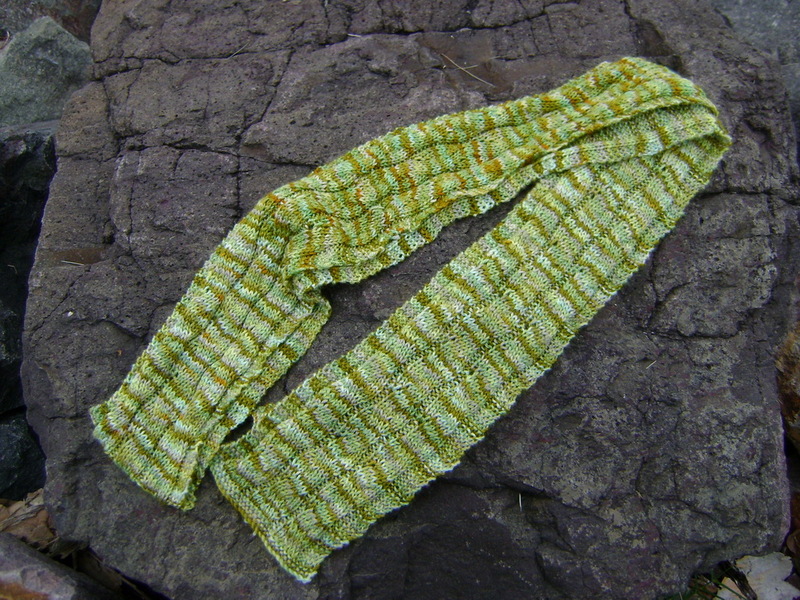 Now, if you’ve been following my blog for a while, you’ll know that I have made a number of scarves from patterns written by Susan Ashcroft (aka stichnerd on Ravelry). 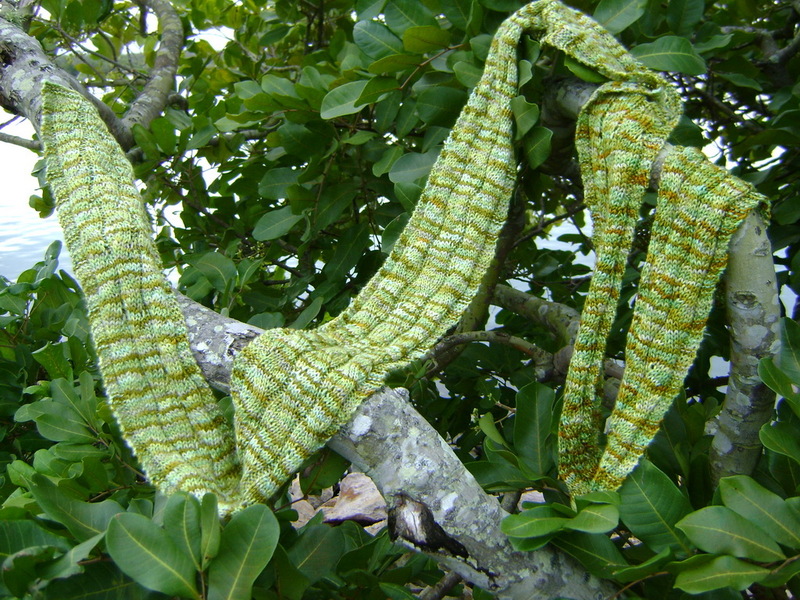 The first one was my Samothrace Wings Scarf, followed by another Samothrace Scarf in a gorgeous Zen Yarn Garden yarn, followed by the Starry Night Cable Bias Scarf, the Serengeti Cable Bias Scarf, the Leafy Bias Scarf and the Chameleon Bias Scarf. You could almost say I’m addicted to Susan’s patterns! Susan has very kindly given me permission to show you the photo that I fell in love with. When I realised the Yolo Scarf pattern was available I instantly purchased it and had the scarf completed in less than a week. 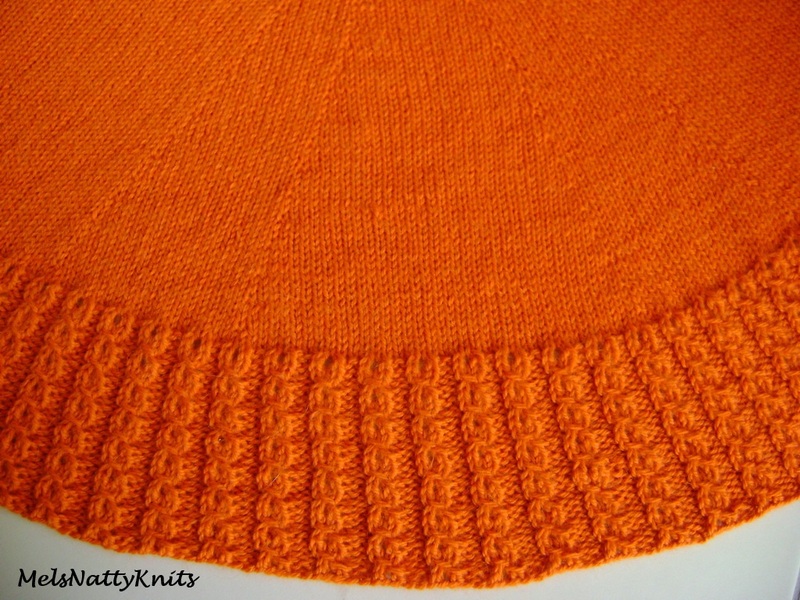 Because I still had the memory of that beautiful orange yarn that Susan used, I selected some gorgeous tangerine yarn that I’d purchased from A Chronic Yarnolohic’s Ebay store a while ago. 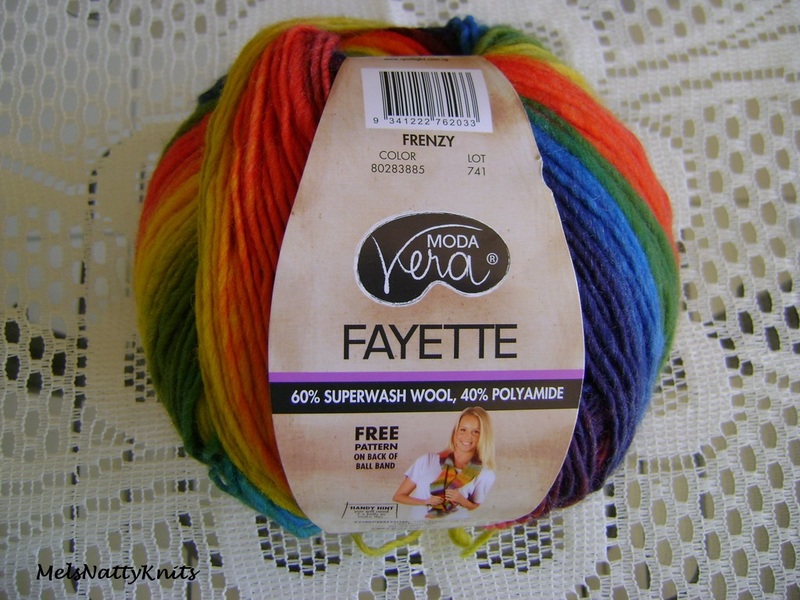 I have since bought the last remaining four balls of this yarn as I love it sooooo much. 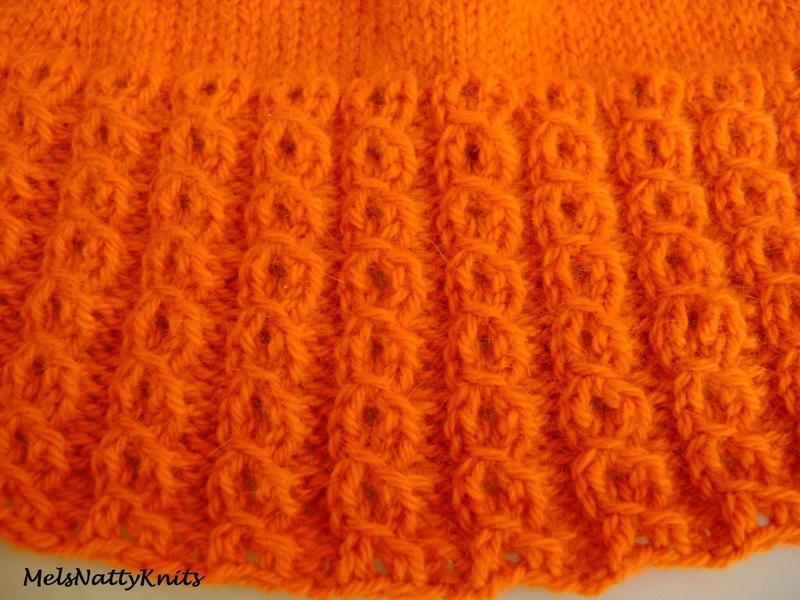 I may attempt to knit my own mock cable hat….unless anyone can point me in the direction of an easy to knit hat that features mock cabling?? 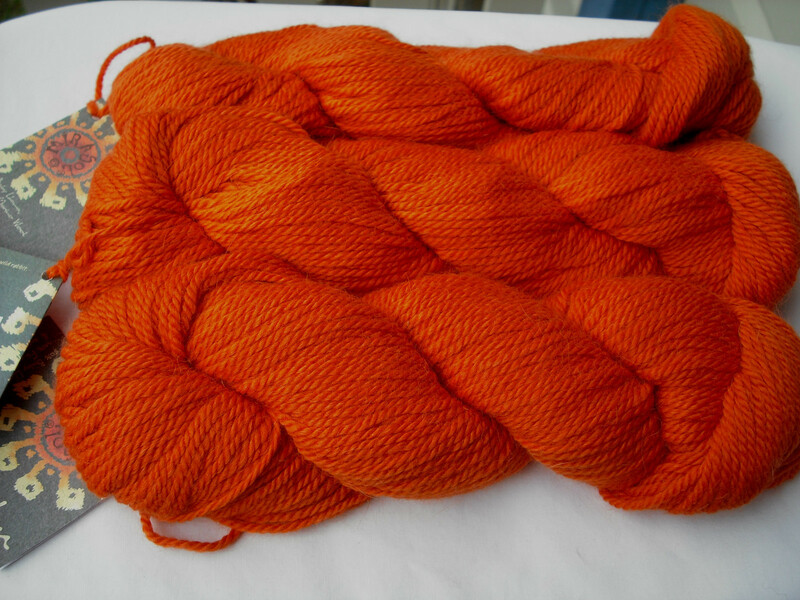 The yarn is Mirasol Tuhu which is a 50% baby llama / 40% merino / 10% angora blend. It is so beautifully soft and squishy and feels glorious against the skin. 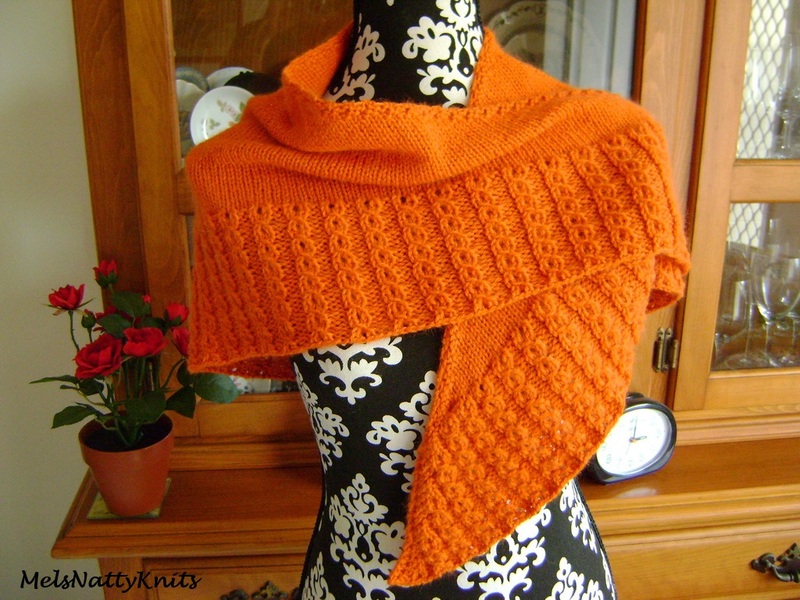 It’s an 8ply / DK yarn and I used size 5.00mm needles for this project. 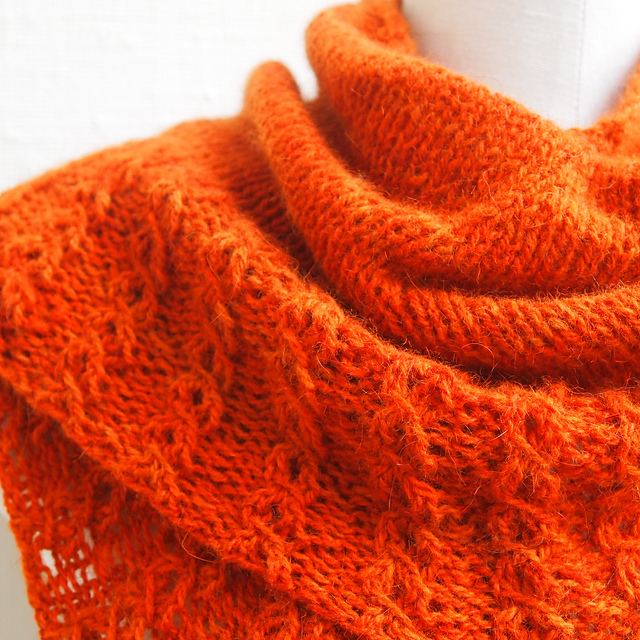 Here it is…… my beautiful Tangerine Yolo Shawl. 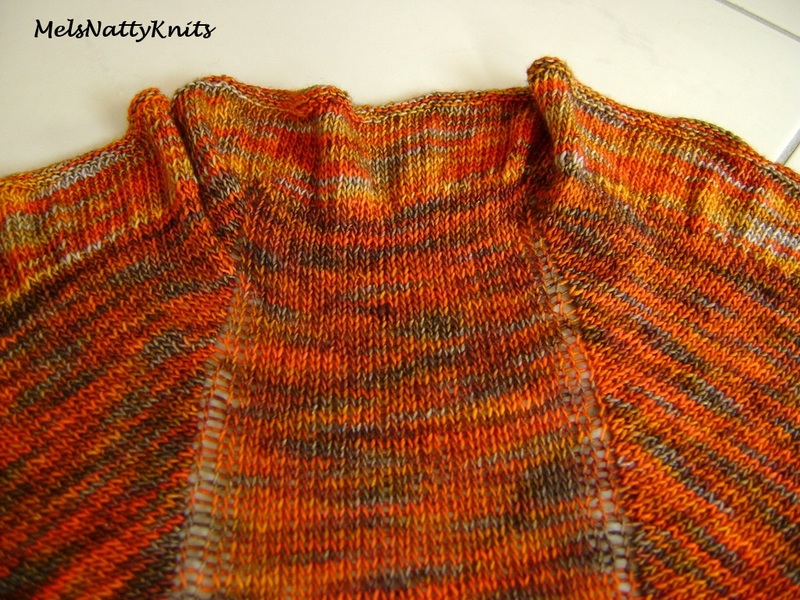 I have always loved mock cables as they’re so, so easy to knit and yet look a lot more complicated than they actually are. I used exactly four balls of yarn to make the scarf and was left with only a small amount of yarn. It only required very light blocking. I love the faint lines that show the increases. 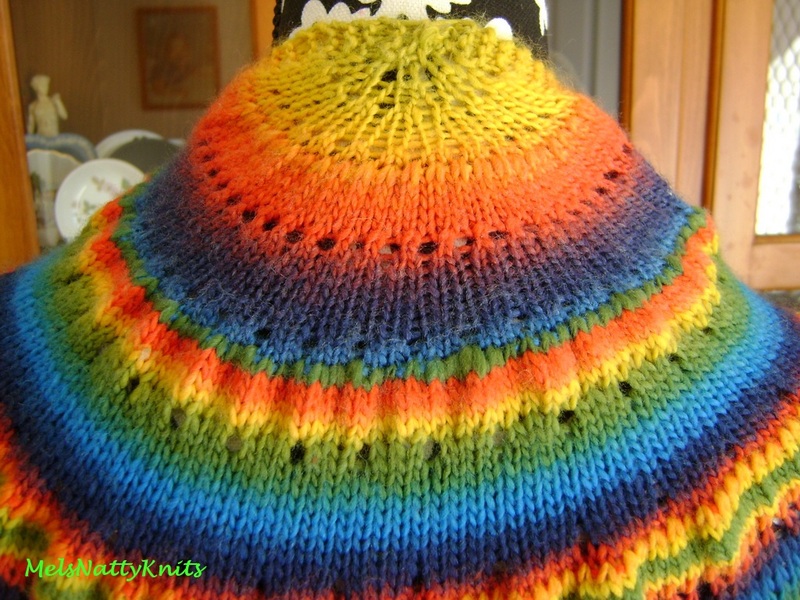 I would highly recommend this pattern, particularly if you’re looking for something that is easy, doesn’t take too much concentration (particularly if you’re talking at the same time) and looks fantastic. 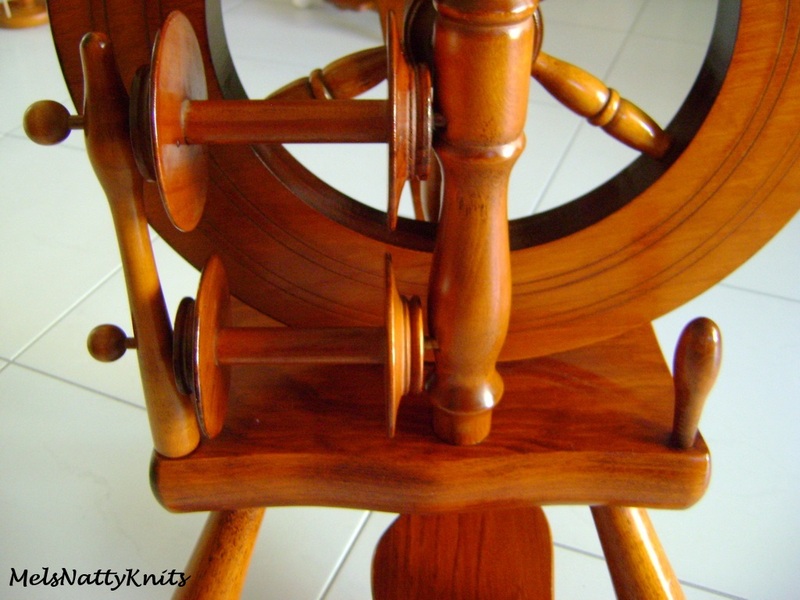 On another note, if you are interested, I have also just started building a website for my local spinners group: The Redland Spinners & Weavers Inc. The group will celebrate its 36th year on 8 August and I am keen to uploads lots of information of the group’s history throughout the last 36 years. I am so excited as it’s starting to look quite good as I add more information and pictures. 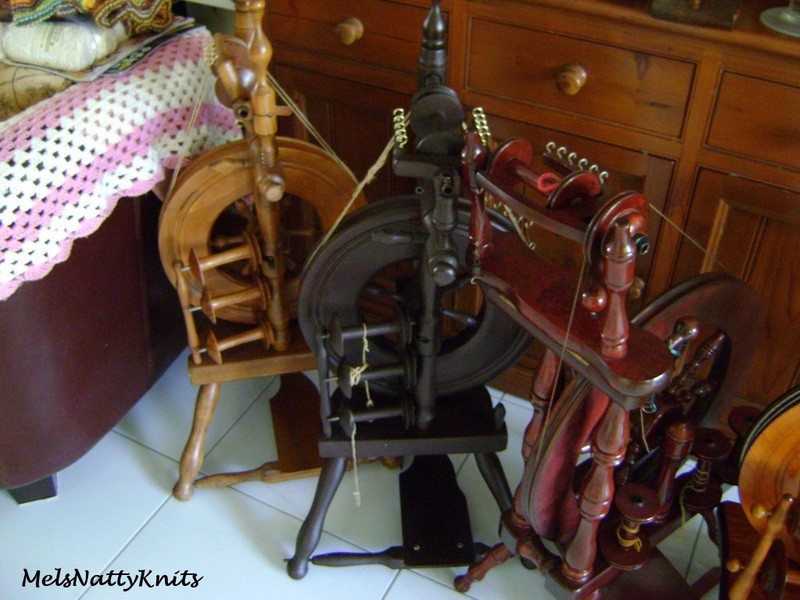 On Sunday I will be demonstrating spinning at the Sandgate Police Citizens Youth Club at The Homegrown Movement’s Trade Off Day. This is their first trade off day so I don’t quite know what to expect but it should be fun. 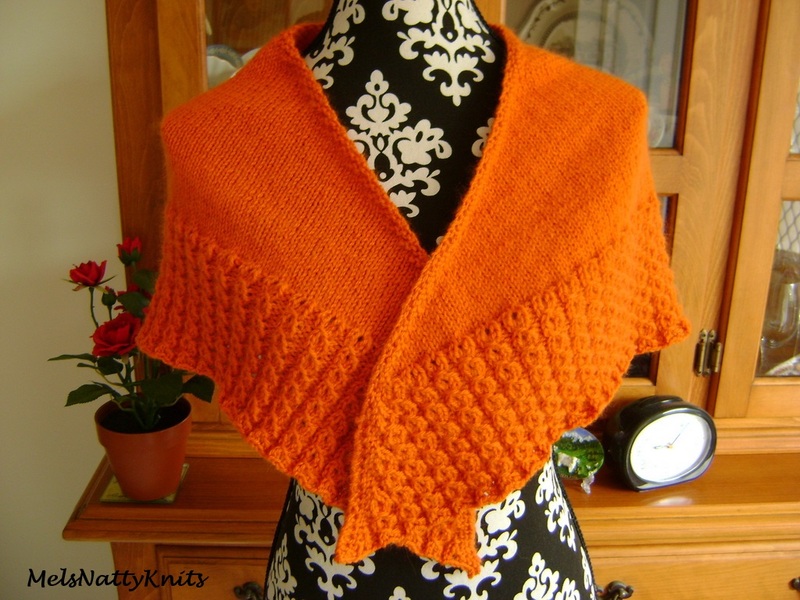 And tomorrow I’m off to Knit and Knatter again. 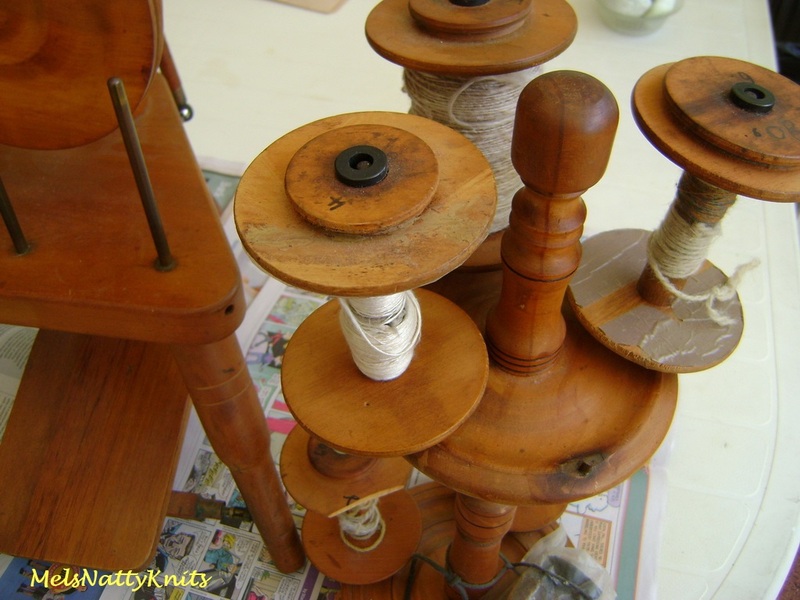 Love these social crafty get togethers with my fibre friends! They say that bright colours make you happy. Well, if that’s the case you should all be happy after reading this post! I’ll start with the yarn first. 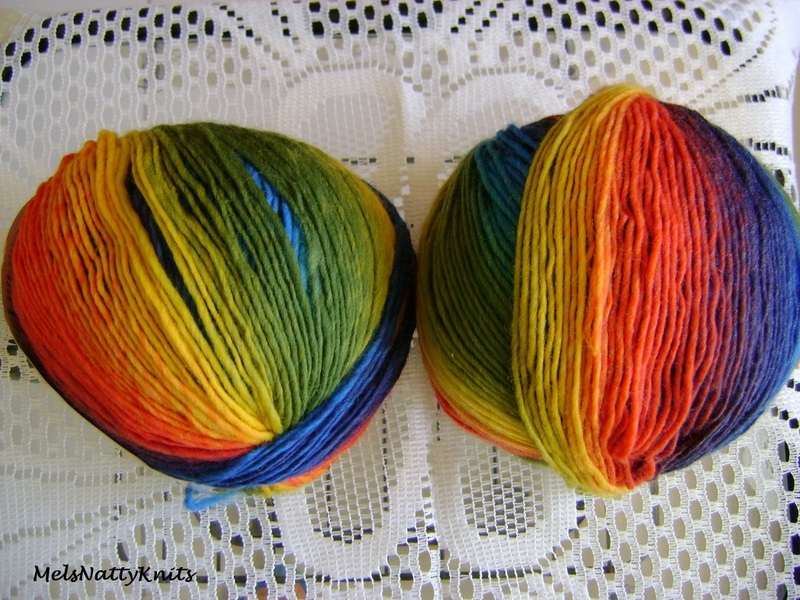 Would you have fallen in love with this brightly coloured yarn? It’s a new one this season for Spotlight called Fayette. 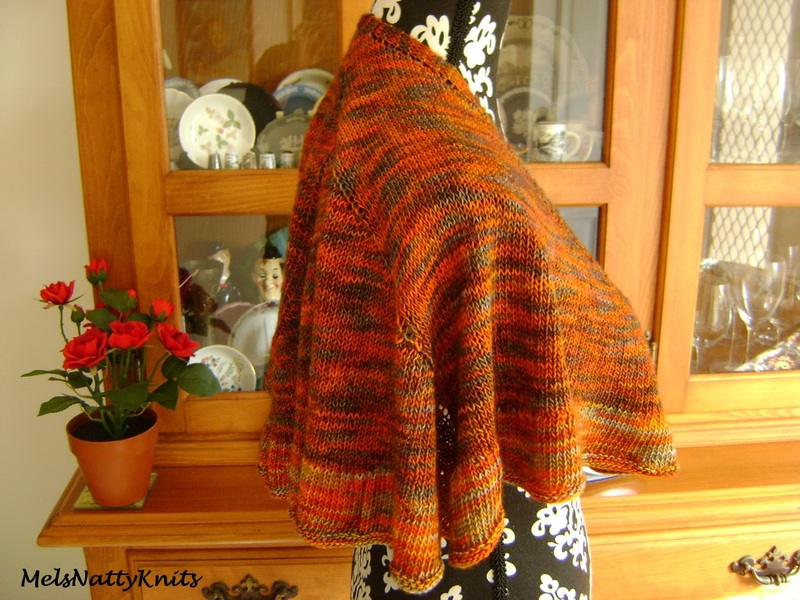 It’s an 8ply / DK, 60% wool / 40% acrylic blend. 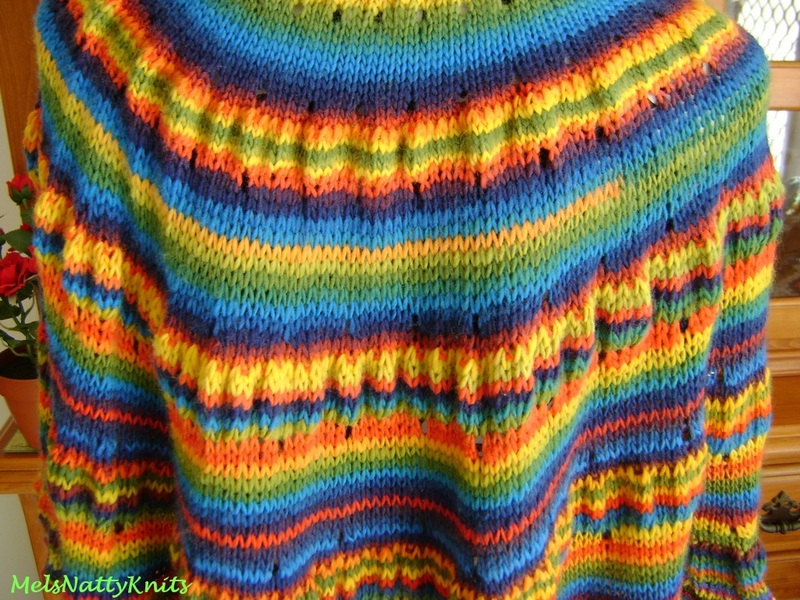 This colourway is called Frenzy. Don’t you just love it? Reminds me of a macaw. 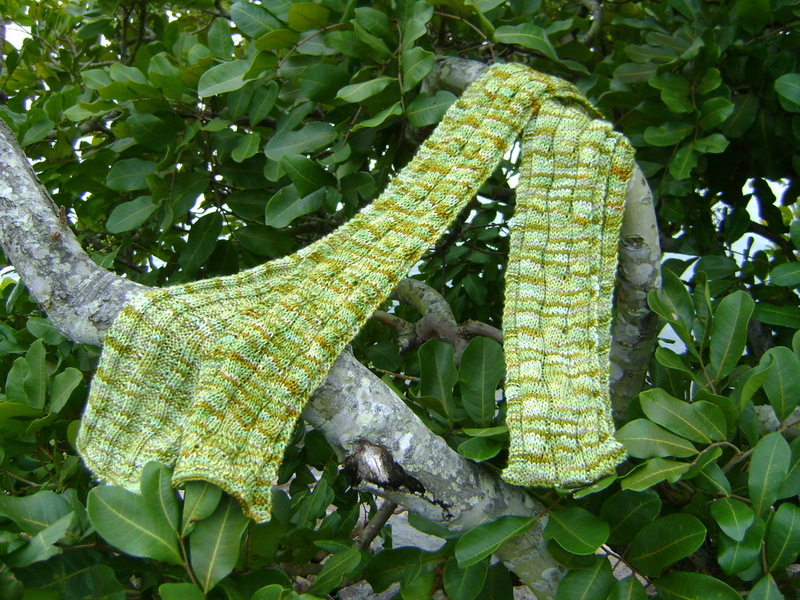 The pattern is called Citron and is free on Ravelry. 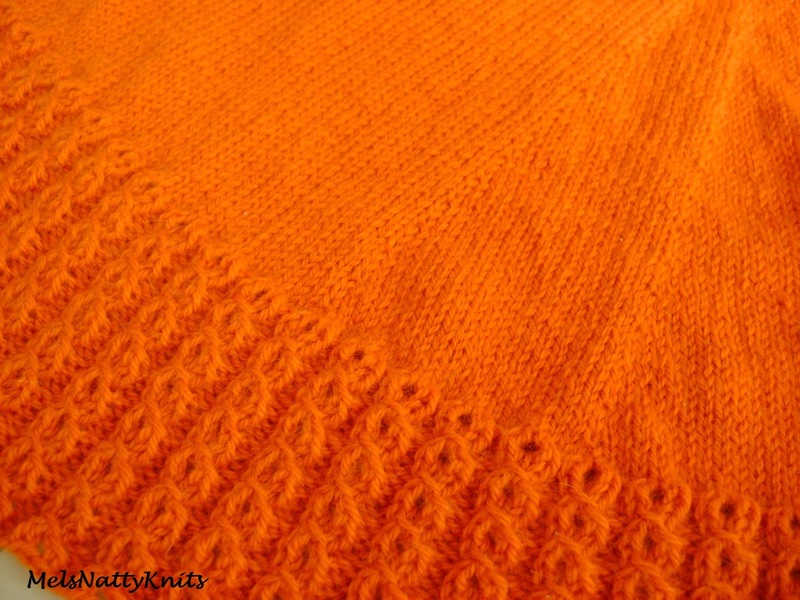 It’s a pattern one of my friends was knitting not long ago in a similarly coloured yarn. 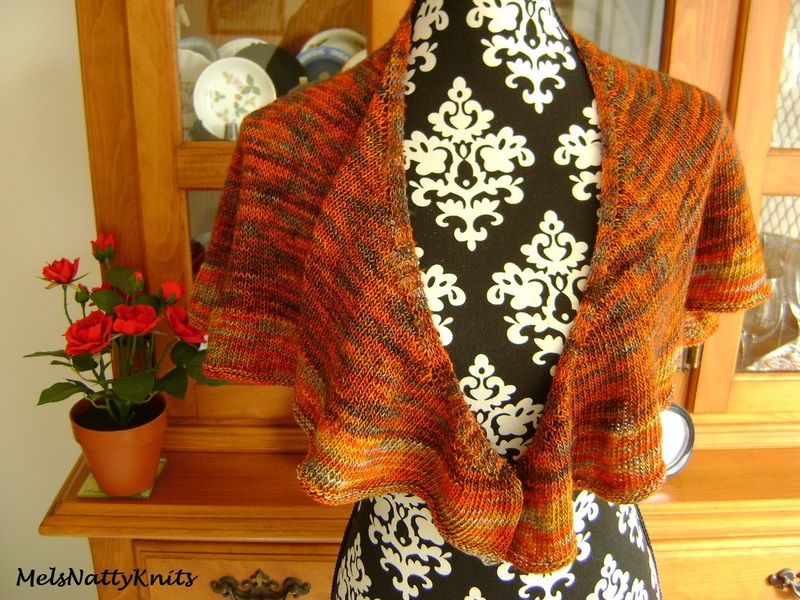 I was quite captivated with it so decided to make a Citron shawl as well. 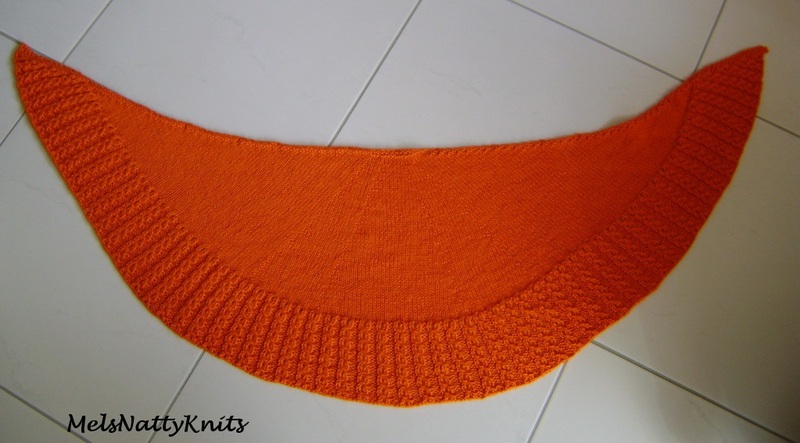 I started the shawl using size 4mm needles and felt that it wouldn’t turn out as large as I wanted it so after a few rows I progressed to size 5mm needles but still wasn’t satisfied so I jumped onto size 8mm needles which made it lovely and big enough to wrap right around me. 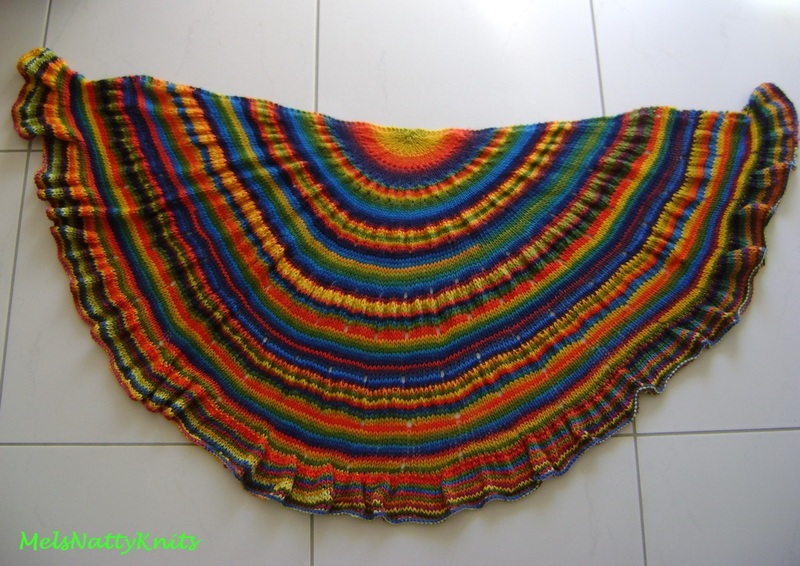 This is a picture taken with the shawl on the floor to try and give you an idea of its size and shape. 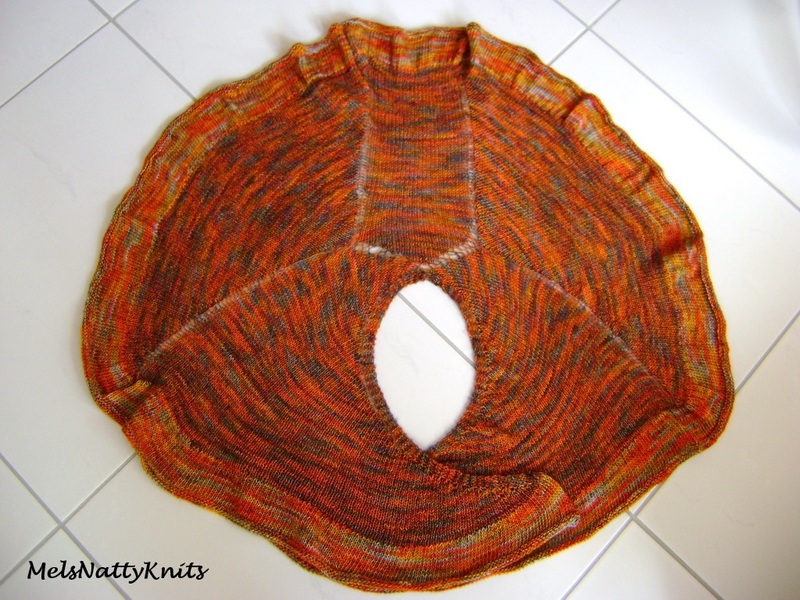 The size 8mm needles really show the m1R holes in the shawl but at least they’re all evenly spaced! 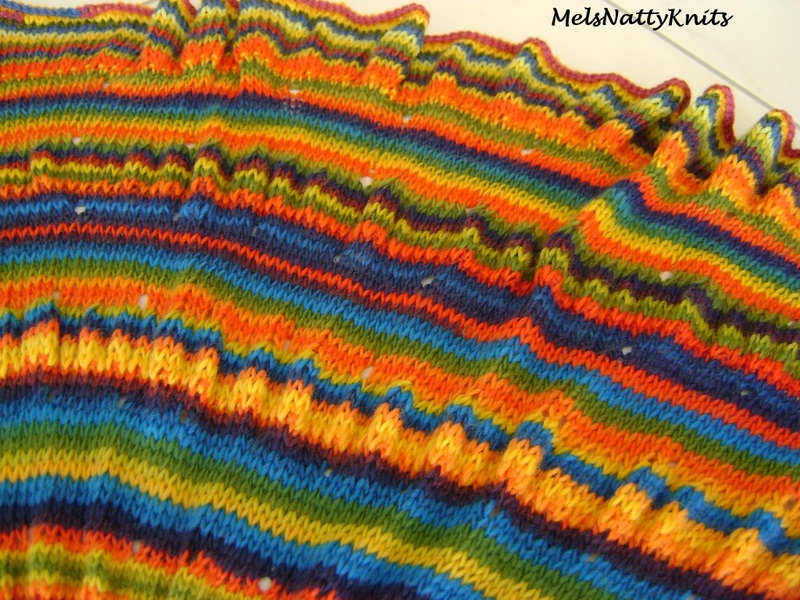 Would you believe the last few rows of the frill are knitted in a different yarn as I ran out of the Frenzy. 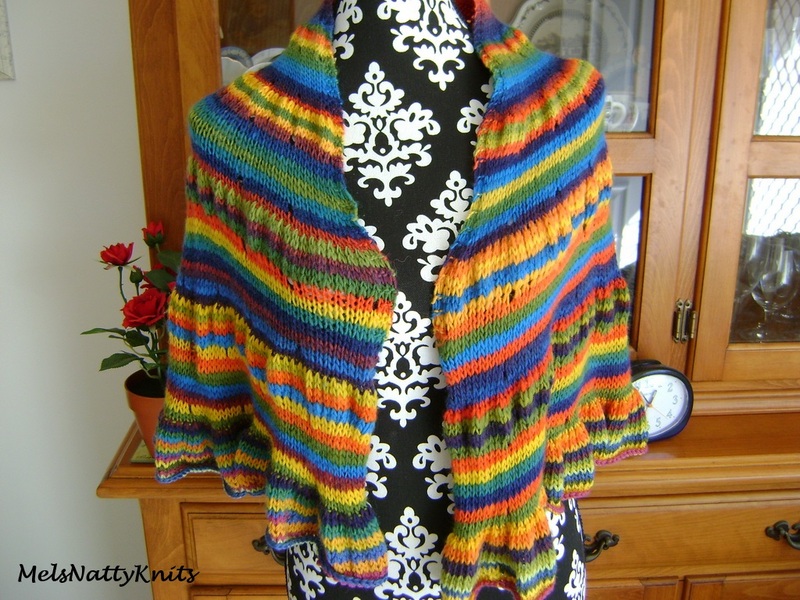 I used a crepe 8ply / DK yarn of similar colours. You’d hardly notice the difference. 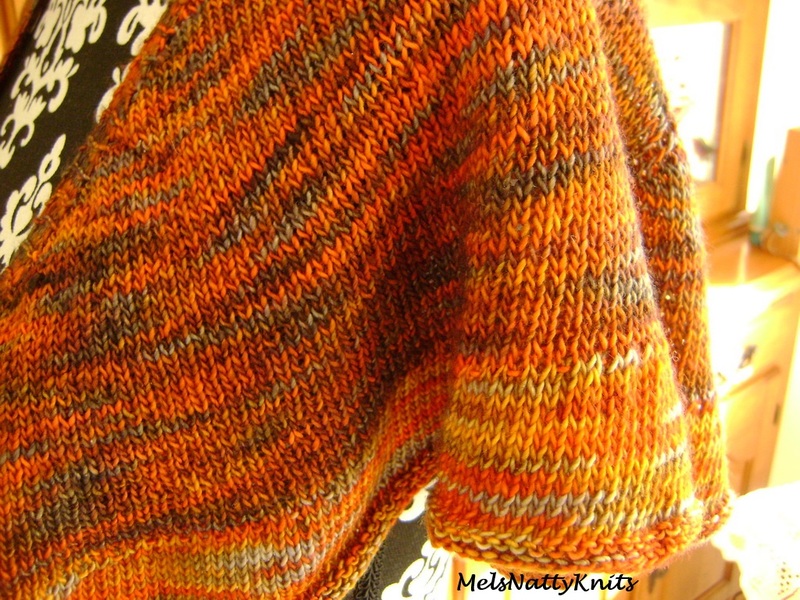 I only did a gentle blocking as I didn’t want to disturb the gentle rouching throughout the shawl. 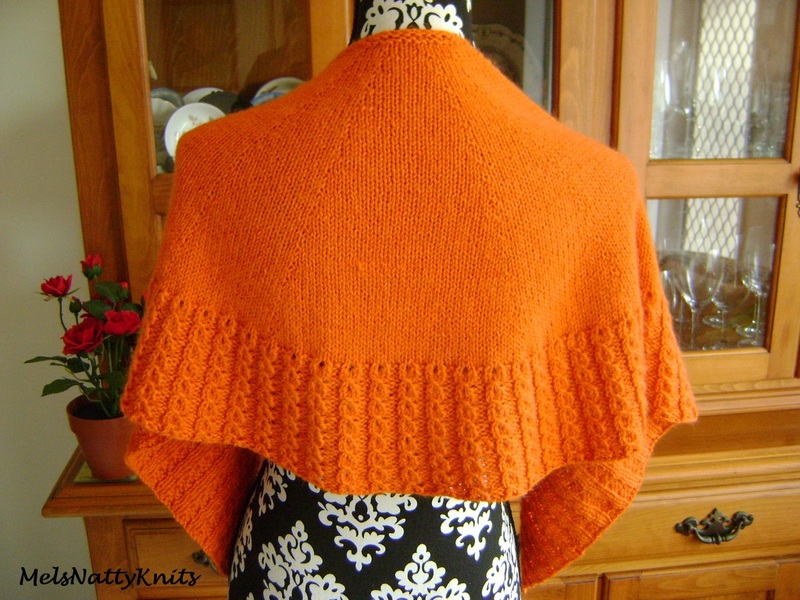 or the frill along the edge. 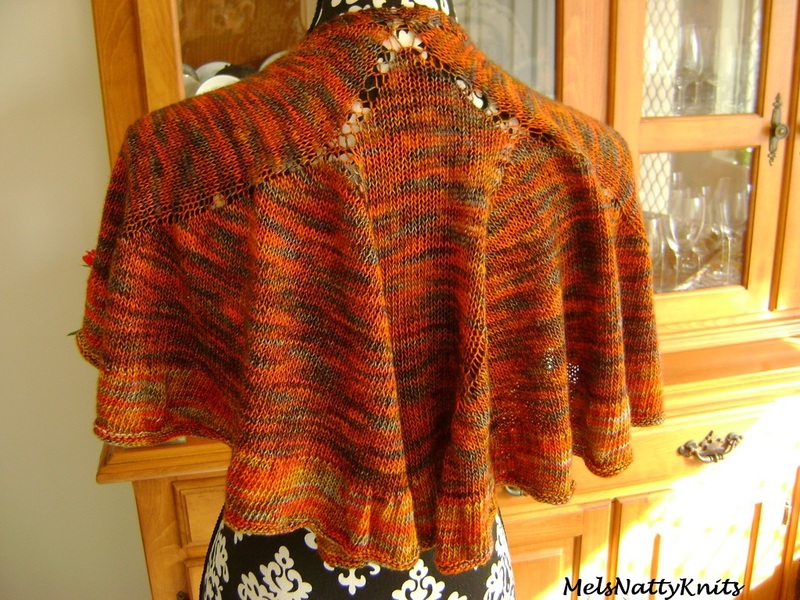 You could say I am very happy with this shawl. What do you think of it? Today I am off to join a yarn bombing exercise at the Terrace Cafe in Cleveland. 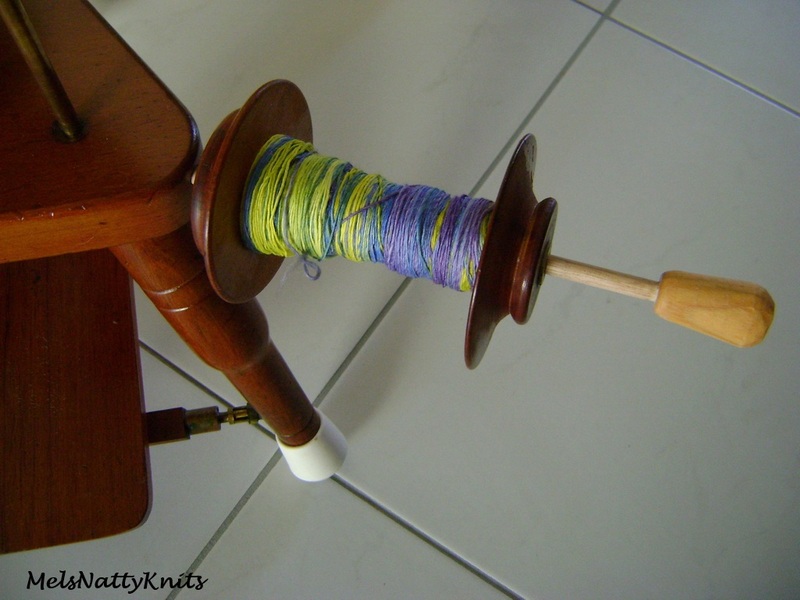 We’ll be yarn bombing a cane chair. It’s part of a Curated Spaces Project being undertaken by Redland City Council so I am hoping a few people turn up. It should be fun! 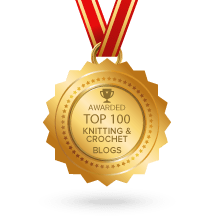 If you look at the picture at the bottom left hand side of the link it shows a small piece of my yarn bombing from a previous project….the brown/cream stripey looking knitting. Sounds a bit like the start of a joke doesn’t it? Rather, it describes the ethnicity of my nine spinning wheels! I’ve shown you some of them but not the latest two that I’ve collected. 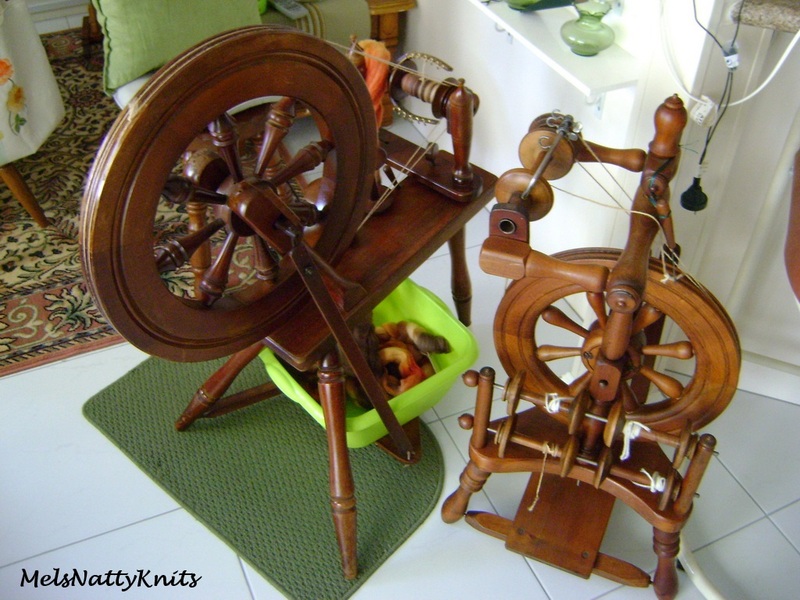 The first one is a beautiful little Fomotor Peacock spinning wheel that I bought from a friend of mine. 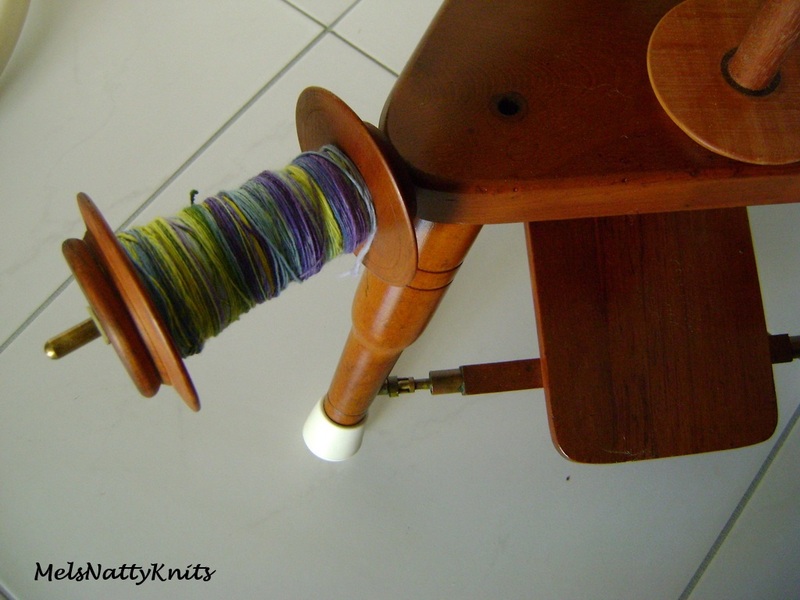 It is the tiniest spinning wheel I own and is therefore so easy to transport. 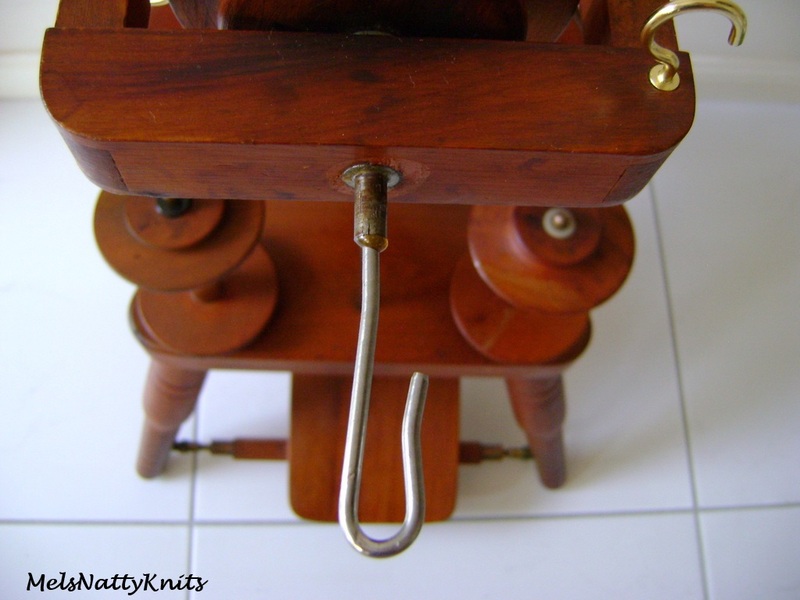 There is no orifice, rather this large hook which I am quite used to now. It also came with a plastic tubing drive belt rather than the usual string that I’d normally use. 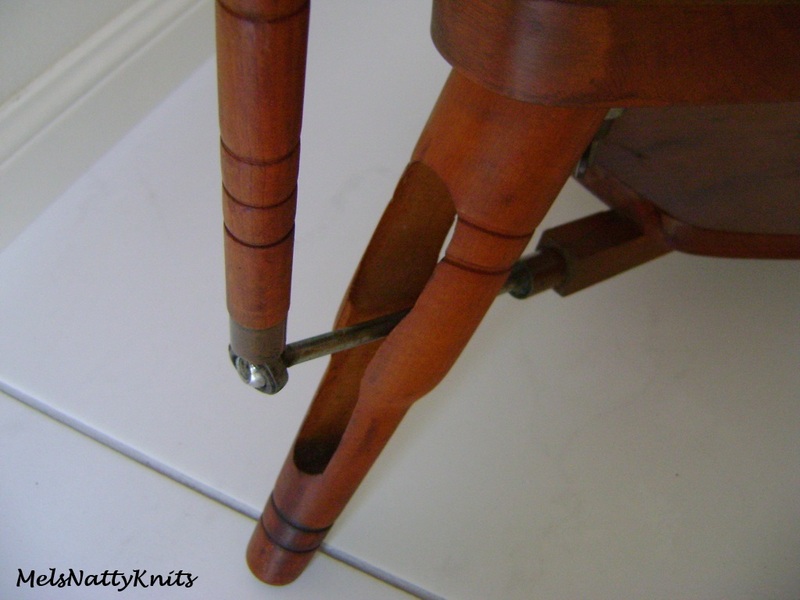 Interesting how the footman connector actually goes through the back leg of the wheel. Even though it’s the smallest wheel I own, it has the largest cup hooks. The hooks were originally right angle hooks however I replaced them with these curved hooks to ensure the yarn didn’t fly off. 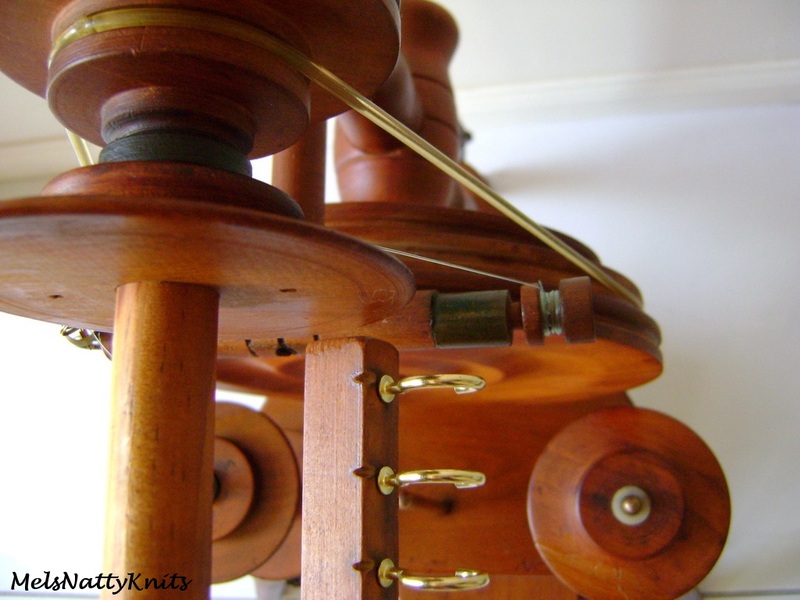 There are three brass looking rods in the front of the wheel which can be removed and two of them placed into holes on the sides of the block to create a very effective plying system. Very clever set up don’t you think? 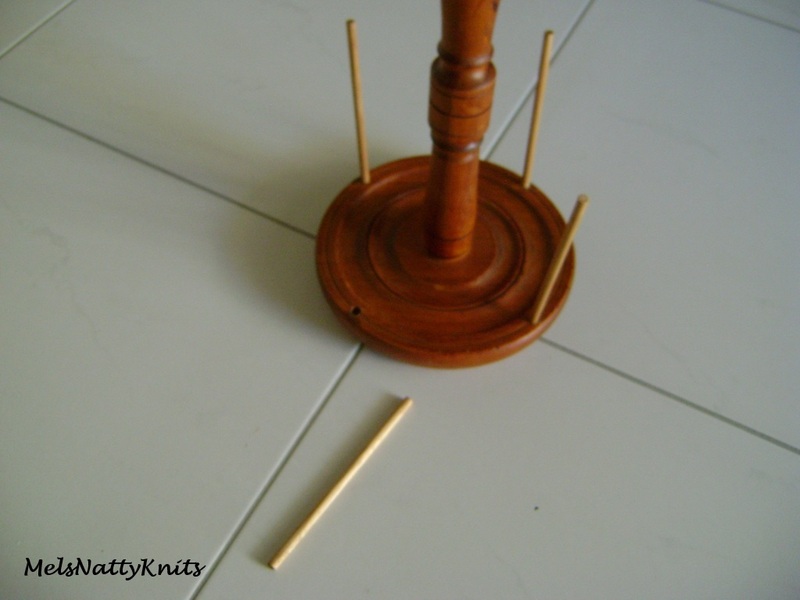 I went one step further and asked my woodturner to make me some wooden rods which do the same job. Voila! 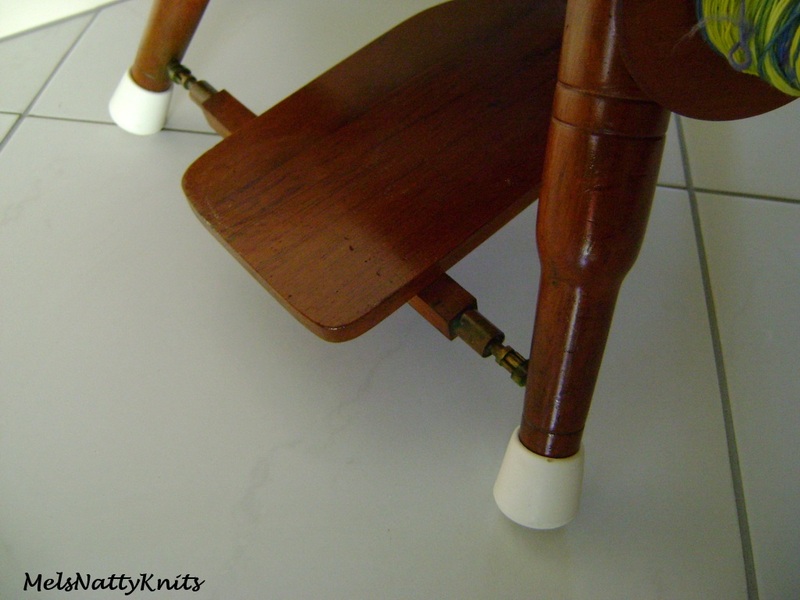 Now I don’t have to remove the brass rods if I’m not inclined to! I also bought a pack of four rubber stoppers which fit perfectly onto the legs of the Peacock which stops it sliding across certain floor surfaces when I’m spinning. This is the lazy kate I received with the wheel. 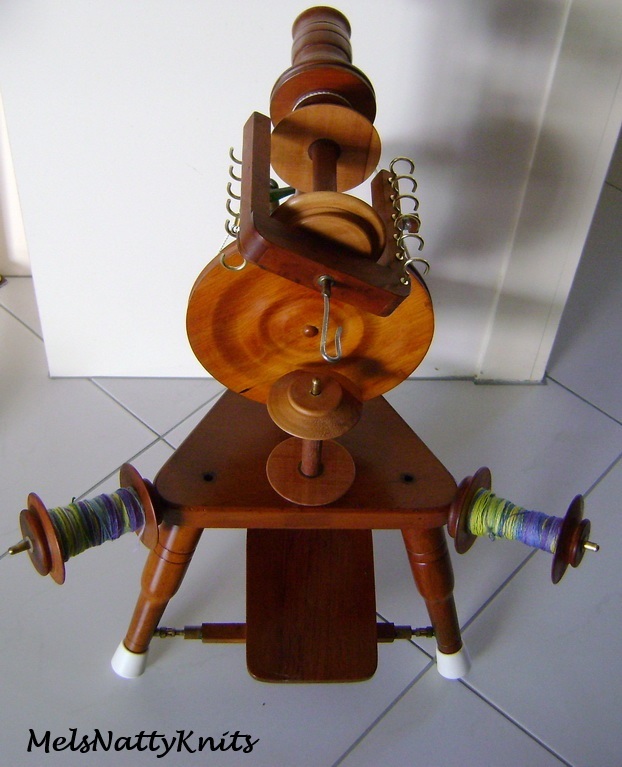 I’m not sure whether it’s made by Fomotor or not but it was in rather a sad and sorry state, as were some of the bobbins. 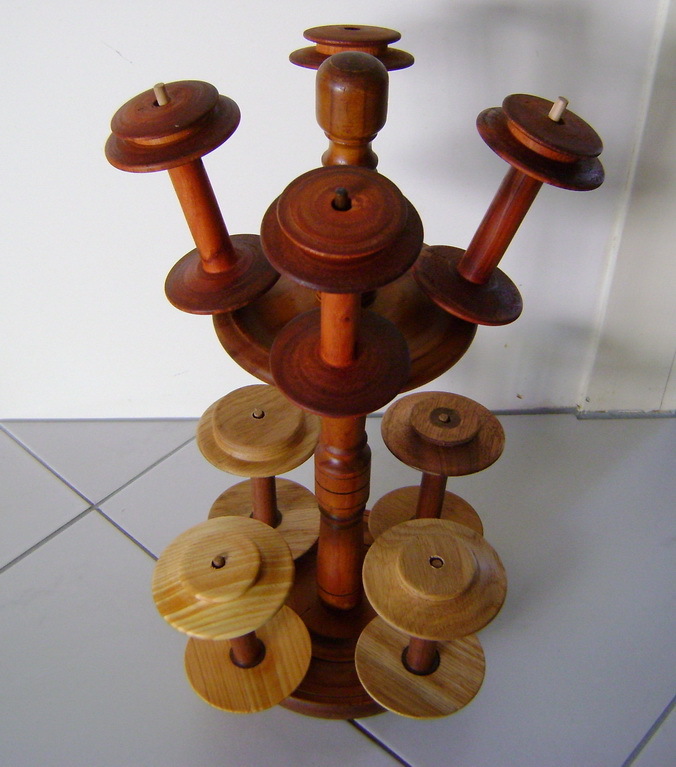 So, of course, it was off to see my woodturner who fixed it up nicely. 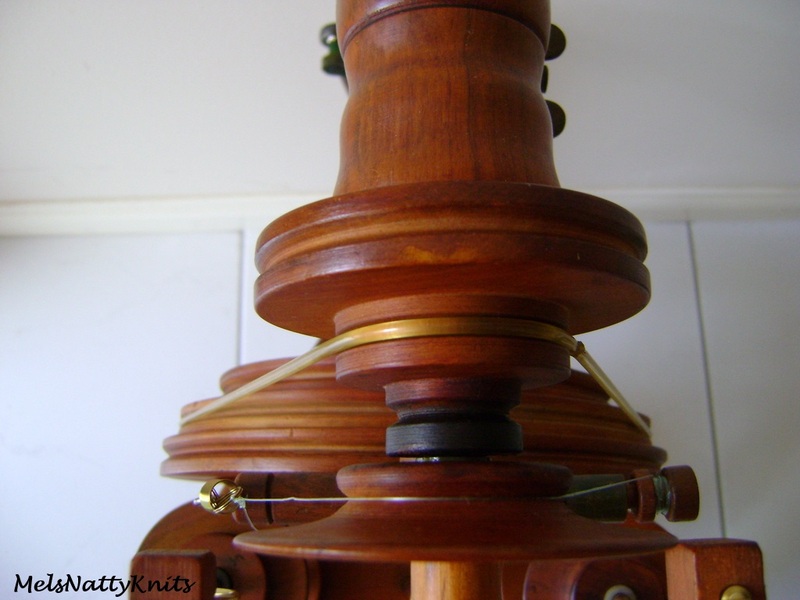 Those bobbins on the top are new ones he made for my Ettrick Standard wheel. 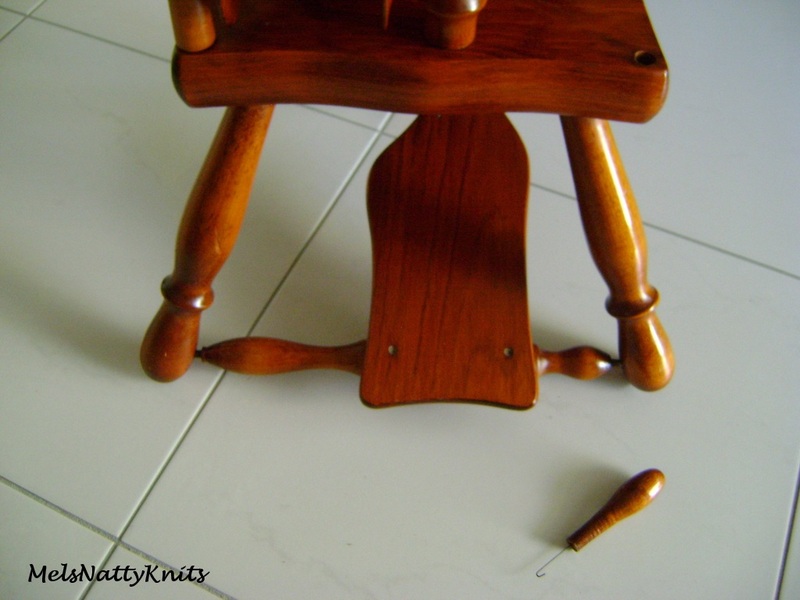 I also asked him not to glue in the wooden rods in case one or two broke. I didn’t want to end up with a piece of the wood stuck in the hole. So now they’re all removable. 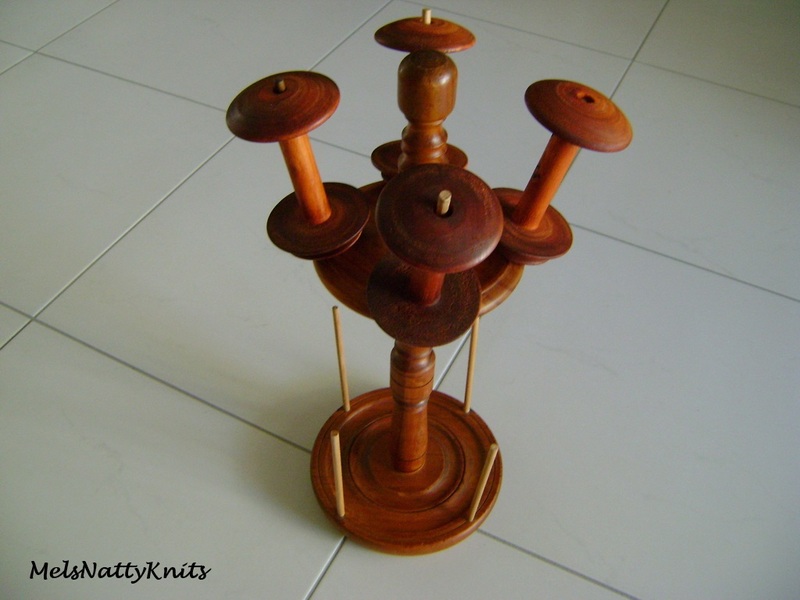 Here’s the newly revamped lazy kate with her eight bobbins. 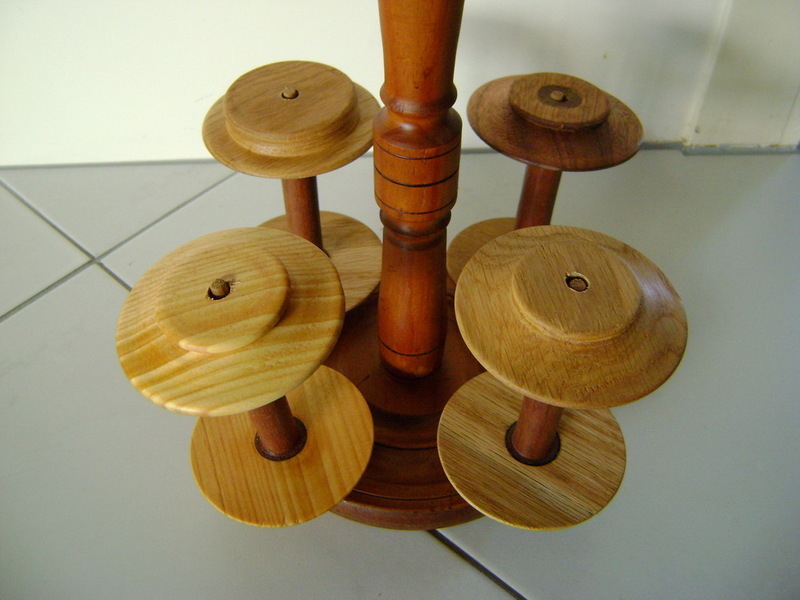 These are four of the six new bobbins I had made for my Fomotor Peacock wheel. Beautiful isn’t it? Makes a lovely conversational piece among my non-spinning friends. 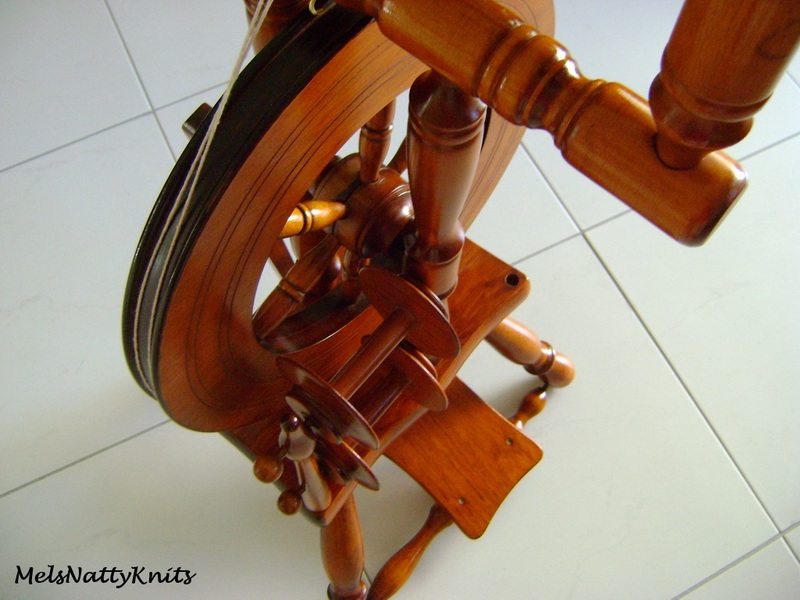 Now to my most recent spinning wheel purchase….an absolutely stunning Crofter from New Zealand. It is definitely the most beautifully polished of all the wheels I own. Look at that gleaming wood! Admittedly I have given it a lovely coat of my 50% boiled linseed oil / 50% pure gum turps magic polish. 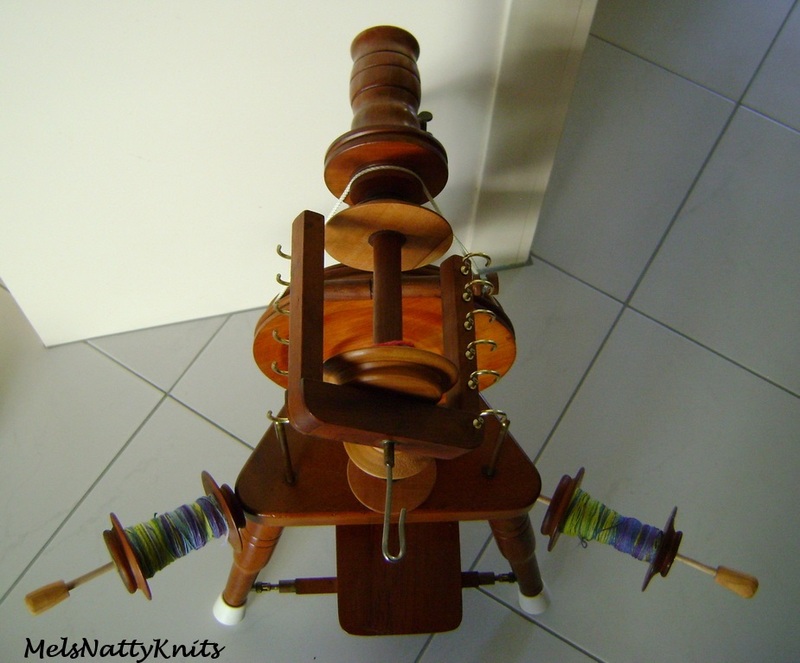 It also boasts three huge bobbins….much larger than what you would find on the Peggies and the Ashford Traditionals and Travellers. 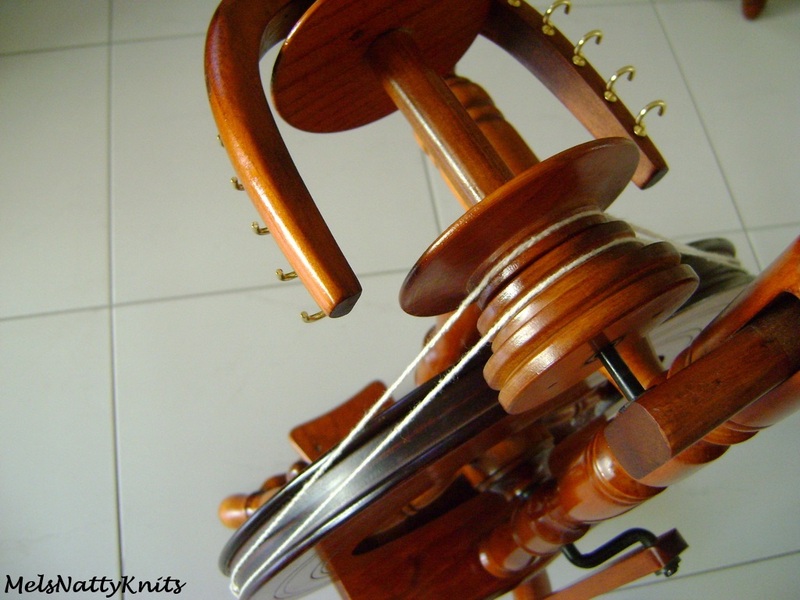 It can also be used as a scotch tension and a double drive which is a bonus as I do like the double drive. Gorgeous isn’t she? The asking price was AU$100 however there was a lot of ‘play’ in the wheel. Even though the hub of the wheel sits securely between the uprights the spokes were a bit loose and slid around causing the wheel to be a bit clunky when it turned so I was reluctant to actually purchase it. So the buyer was happy to take AU$50 as I was taking a risk if I couldn’t fix it. 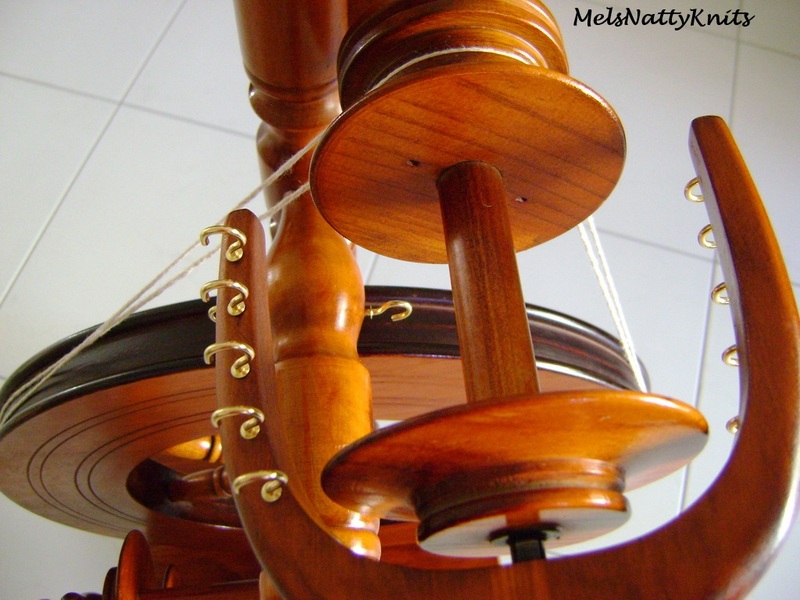 I gave it to my woodturner who took the wheel apart and did a bit of his magic. Even though it’s still not 100% it can at least be used and is not ‘clunky’ any more so I am happy with my investment. The presentation of the wheel alone is worth the AU$50 as it is so beautiful. Would you have bought it for AU$50 and taken the risk? So now I am the proud owner of seven Kiwis. L to R: Little Peggy, Wee Peggy, Ashford Traveller, Crofter, Fomotor Peacock and two Ashford Traditionals (plus the full lazy kate sitting in the front). 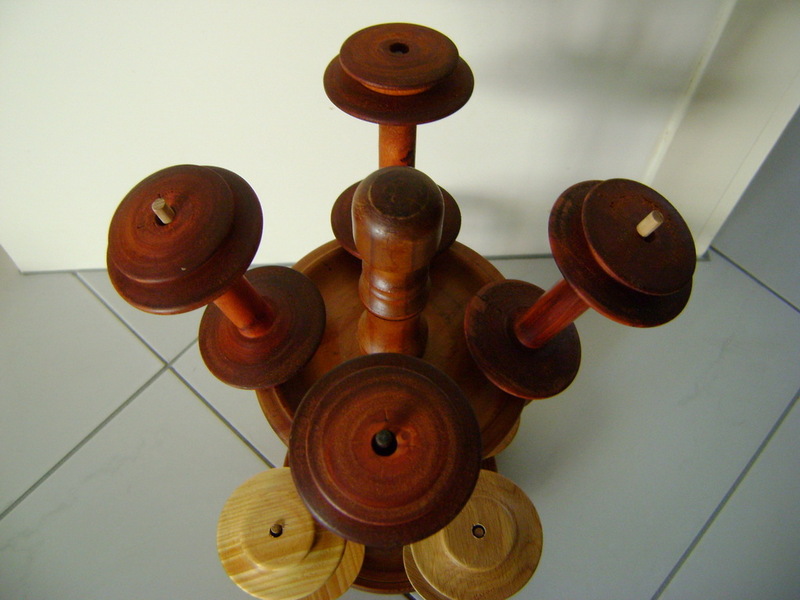 A lot of my friends ask how I can possibly store nine spinning wheels in my townhouse. Well, as you can see, when they’re packed up beside each other they really don’t take up much room, especially the upright wheels. And two Aussies. From L to R: Ettrick Standard and Tarra Carousel. Phew that was a mammoth effort loading all those pictures! 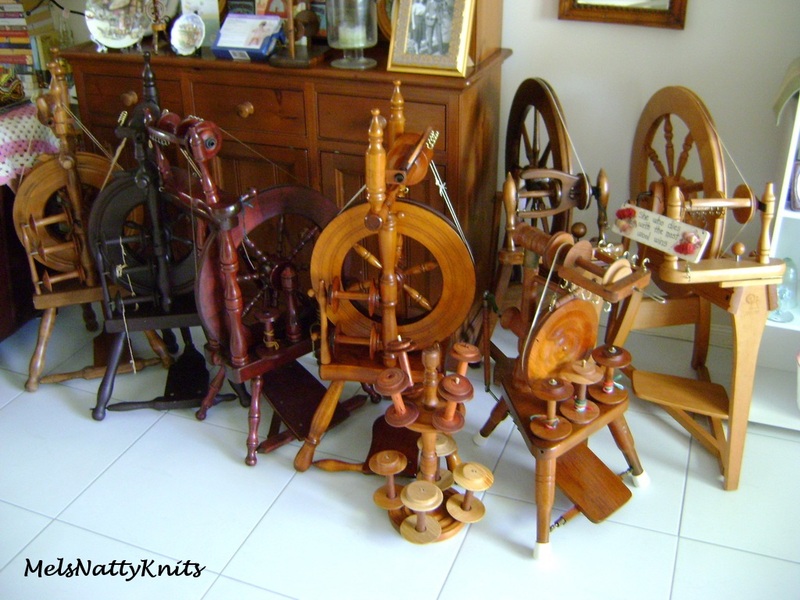 And in case you’re wondering, well yes I still keep an eye out for spinning wheels to add to my collection. I’m never sure what I’m after but when I see it I know straight away I have to own it! 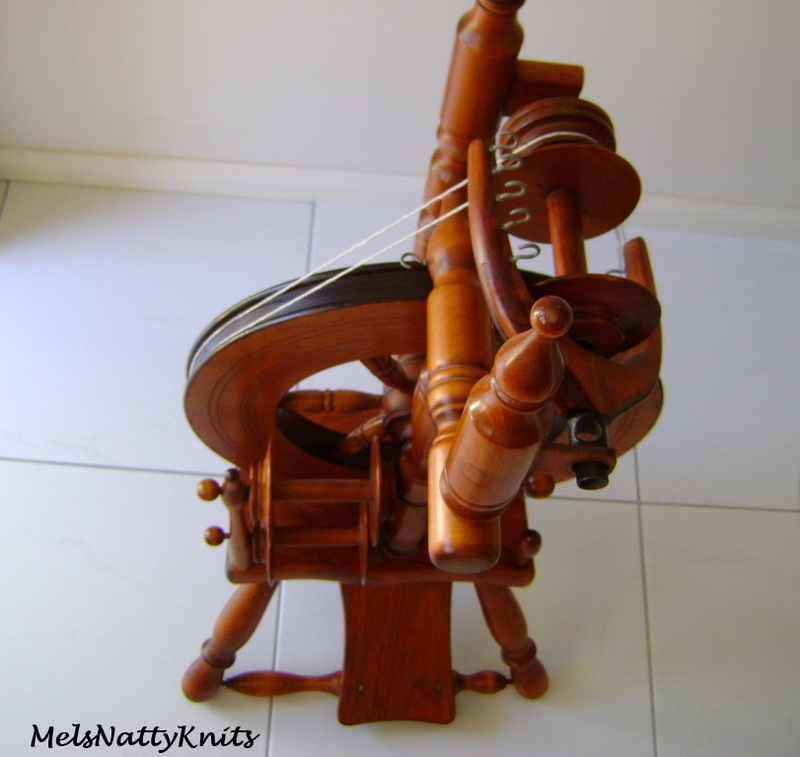 BTW if you’re ever trying to identify a spinning wheel always go to the New Zealand spinning wheels website which is administered by a very knowledgeable Mary Knox. 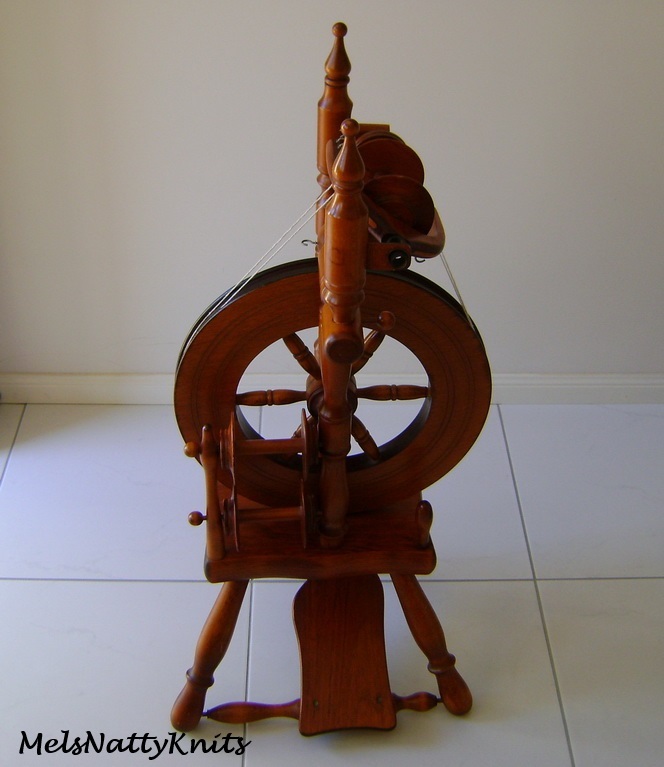 There’s also a section for Aussie spinning wheels too. 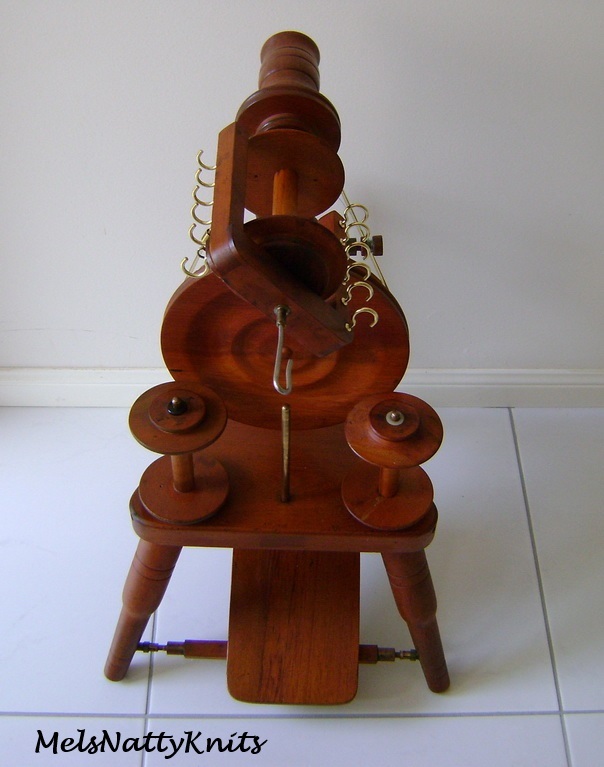 I find it invaluable for trying to source the makers of my spinning wheels. Mary is also very grateful to receive any information to add to what she has collected. You can contact her directly through the website. I also pdf any literature I have gathered over the last couple of years that relates to wheels that are no longer made. 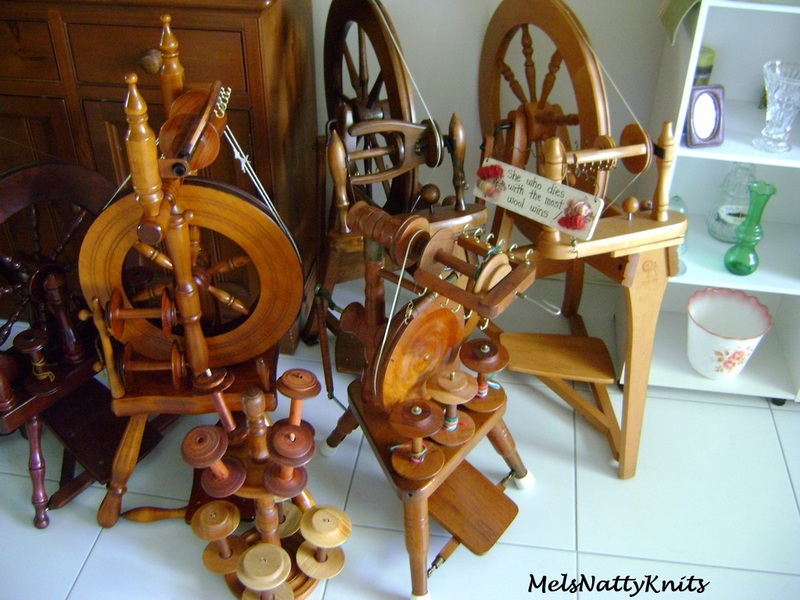 You can find them under the Spinning Wheel Info section of my blog which is along the top banner of the website. Just another look at those Kiwi wheels….three in this picture (love all the different colours of the wheels). And four in this picture. 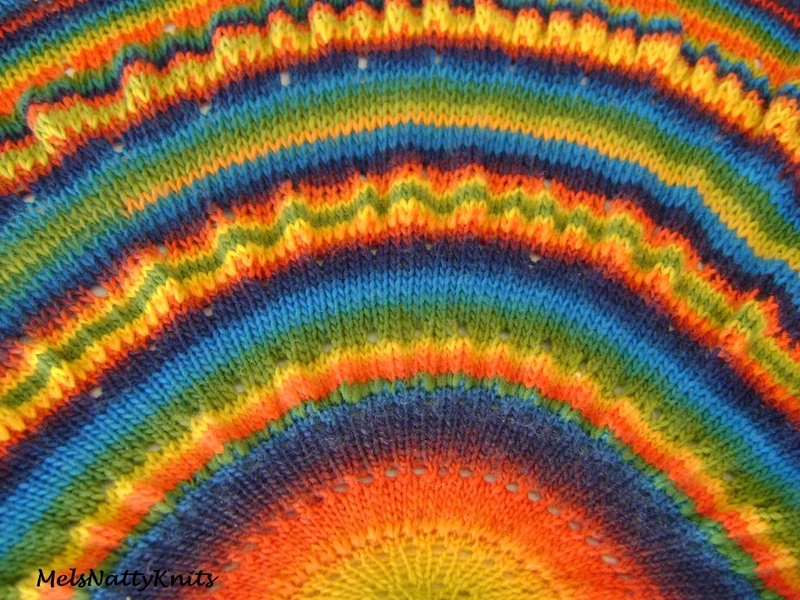 I’m off to Knit and Knatter this afternoon to join my spinning and knitting friends to share some laughs and knowledge as well as to drink lovely coffee and eat sinful cakes! 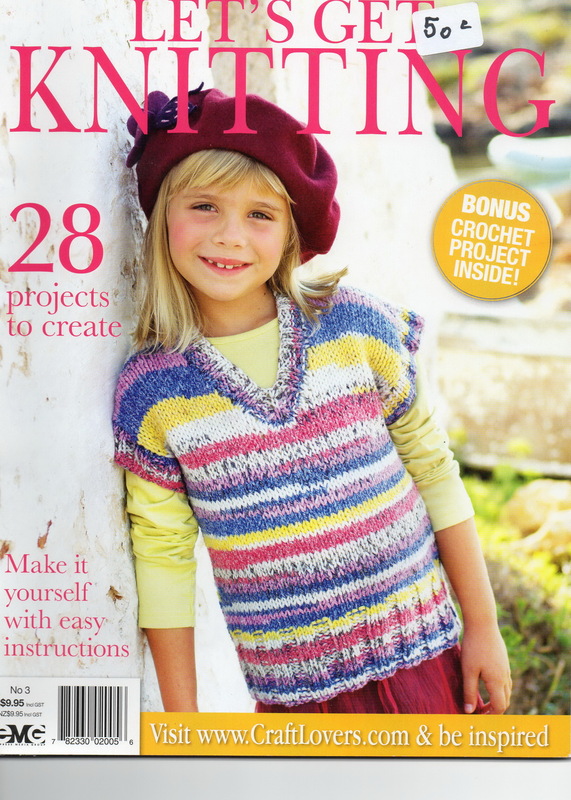 Plus show off our latest knitted and spun projects. 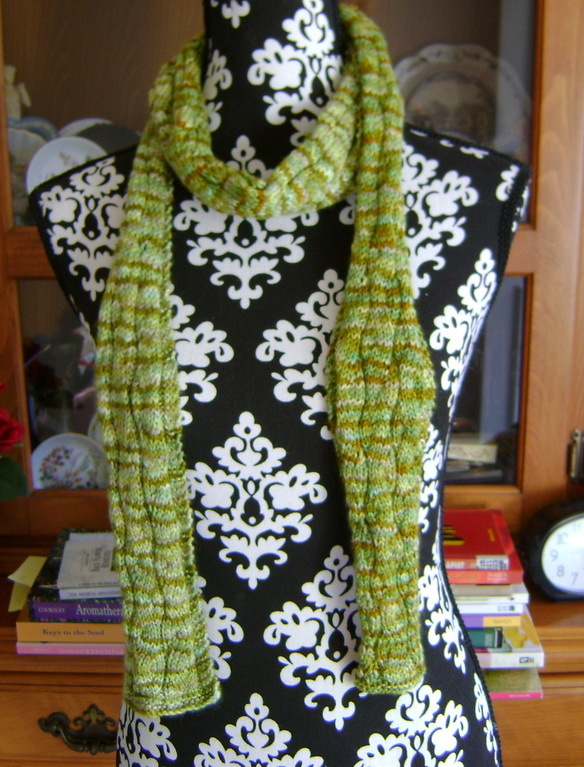 I’m embarrassed to tell you how long it took to make this scarf although when you look at the length of it that’s a good reason! I started it on 24 February 2013 and finished it on 7 July 2013. I get a bit bored knitting the same pattern repeat over and over again so I tend to start multiple projects and juggle them all. No wonder I have so many UFOs!! Plus it’s taken me months to show it to you too. We’ll call it a project that slipped through the cracks! 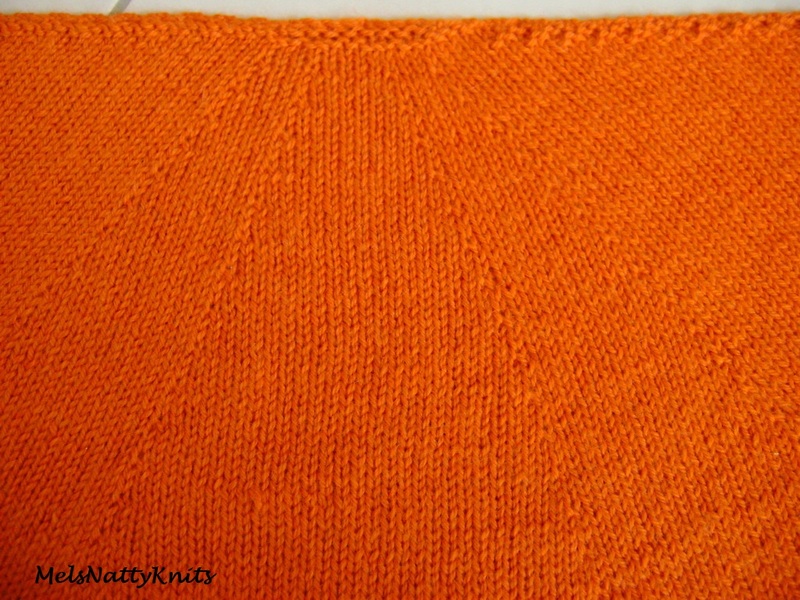 Even though I blocked the scarf the yarn tends to fold into itself so the scarf is now permanently quite narrow. 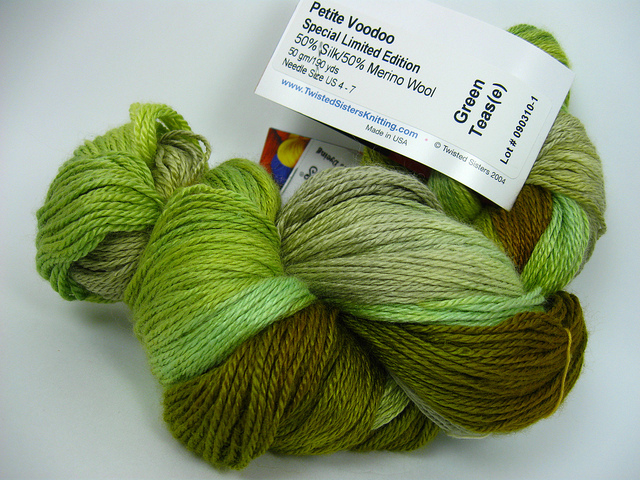 The yarn I used is Twisted Sisters Petite Voodoo which is a 50% silk / 50% merino wool blend. It is deliciously soft and silky around my neck. 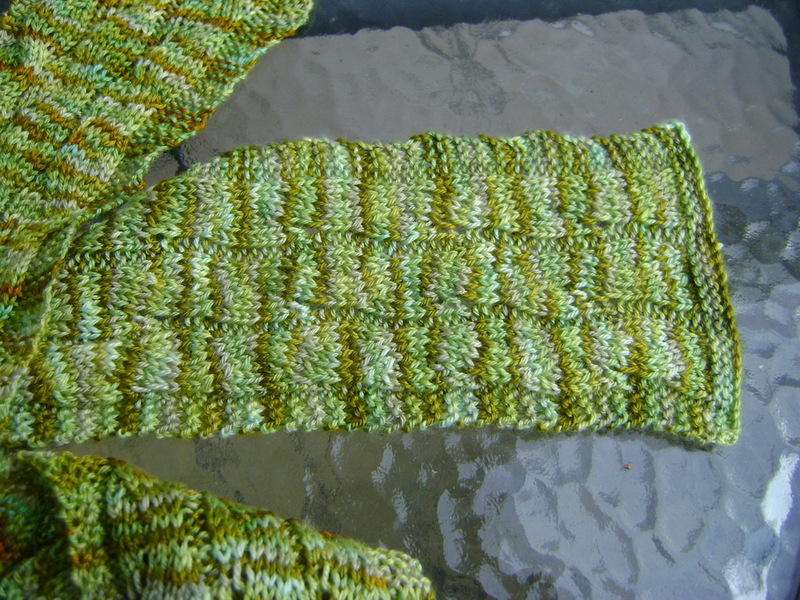 The colourway is Green Teas(e) – a gorgeous blend of greens. 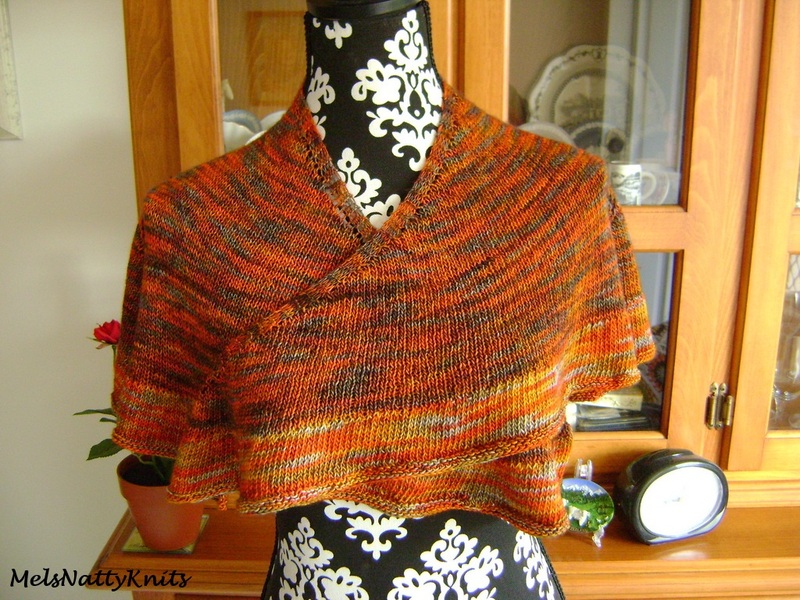 The pattern is called Falling Water and is another free knitting pattern that can be found on Ravelry. 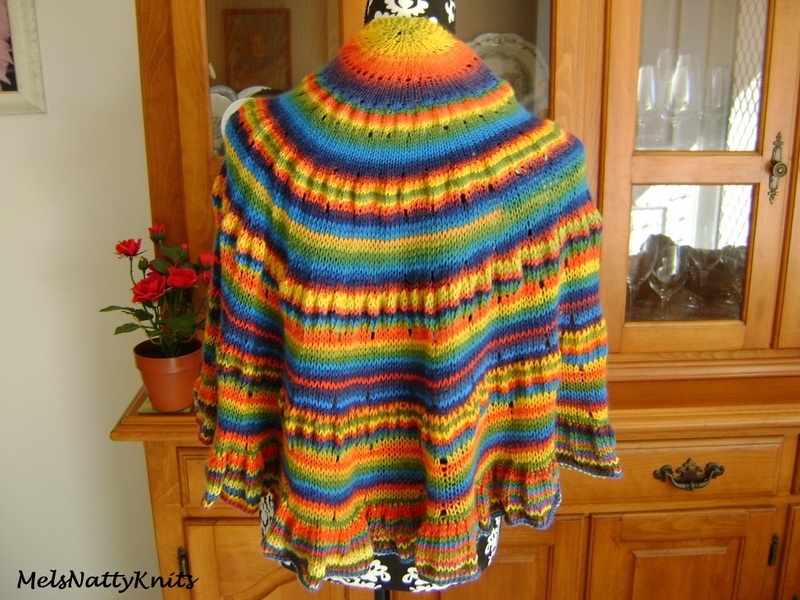 The cold weather finally hit Brisbane this morning so hopefully I’ll be able to start wearing all my woolly knits. My family is celebrating my Dad’s 90th birthday tonight with a lovely dinner at the Hilton Hotel. I hope Dad likes the scarf I made for him. No doubt he’ll be wearing it tomorrow as it’ll be 7 degrees Celsius in the morning. 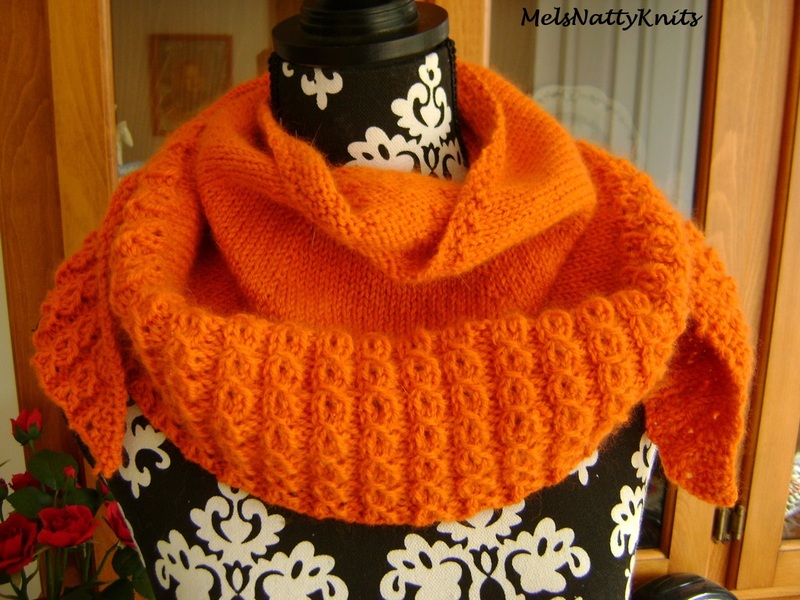 Perfect for scarves!